Are the cold dreary days getting to you? Are you day dreaming of warm, balmy, sun drenched days lazing in a tropical climate? Then why not take a well deserved break and unwind in Cairns! I started my holiday by flying into Cairns Airport, where I picked up my hire car and drove about 20 minutes to the WorldMark South Pacific Club by Wyndham Cairns Resort. The apartments are located within the Trinity Links Resort, about 10 minutes from the centre of town. Each WorldMark apartment is very spacious and nicely appointed including ceiling fans and air-conditioning to keep the temperature cool during those humid days. All apartments boast a balcony overlooking one of the two 50-metre pools, children’s paddling pool, hot and cold spas, all nestled amongst lush tropical gardens. The resort also features a gym; sauna, barbecue areas and tennis court and borders the Cairns Golf Club. It is within easy walking distance to the local shops so you can stock up on food & drink supplies. 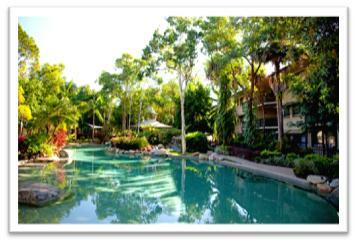 Cairns is bursting with attractions and activities there is so much to choose from. Here are some of my favourites!! 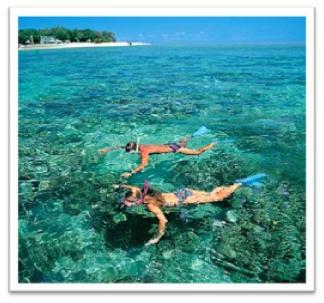 Snorkelling and exploring Green Island – Absolute must do! We chose to spend the whole day out there, driving into Cairns early to depart on the 9am cruise. We had heard great stories of the island and it lived up to the expectations!! Perfectly white sandy beaches, unique island rainforests and the most amazing coral reefs and marine life, you will love it too! 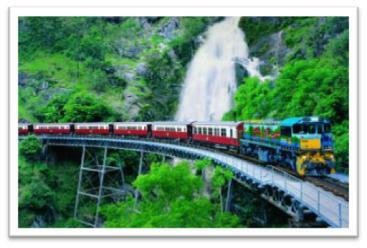 Kuranda Railway – Kuranda railway is famous for its magnificent engineering feat starting back in the late 1800s and its unsurpassed view of a World Heritage protected rainforest. The train departs Cairns early in the morning and takes about 2 hours to wind its way up to Kuranda station. It is a spectacular journey going through dense tropical rainforest, past steep ravines and beautiful waterfalls. Once up at Kuranda you have a selection of activities to choose from all showcasing the natural wonders of the rainforest ranging from the Skyrail (which I highly recommend) to Aboriginal cultural parks and wildlife parks. Exploring Cairns – Walk along the esplanade, featuring a huge sandy swimming pool lagoon, welcoming grassy picnic areas with free bbq’s, waterfront exercise tracks, children’s playground or just sit back on the tranquil waterfront and admire the view of the Trinity Inlet. Stroll along the Cairns Marina and browse through the shops in The Pier shopping centre or choose from a selection of quality waterfront dining options overlooking the large boats. For a cheaper alternative I recommend checking out the Cairns Night Markets, open from late afternoon onwards showcasing local and indigenous artworks, tourism trinkets and a wide variety of tasty food court choices. Have you planned your winter escape? ← French vinaigrette on the go! Hi Jody, that is awesome to hear you had a great holiday in Cairns! What was the best thing that you did?